Over the past year, I've overseen the installation of many Coulomb charging stations, and I gotta say, I'm real impressed with the product...both from a hardware and a software point of view. Given that the world is at the early stages of installing EV infrastructure, you would expect a new product to have some rough edges, but the Coulomb products are well designed and miles ahead of the competition. unit and Palmer Electric installed it. High quality construction. The product assembles easily, the small aluminum body looks good and it's strong. 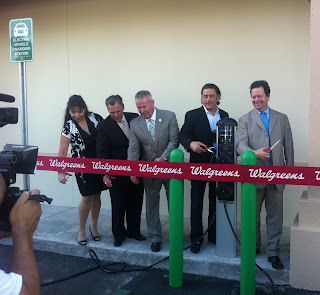 The product can be installed on the wall, pole, or bollard...all using the same "guts" so they all look and work similar. They even have a new model that has cord management. Lockable holsters. When you walk up to a Coulomb unit, the J's (J1772 plug) are locked into the device and cannot be removed until you authenticate with the charging station. This help's keep the J's from being stolen and it helps guide the customer through the charging experience by unlocking and lighting up the holster that they can use. The fluorescent display is bright and readable in all light except for direct sunlight. The "host" (owner) of the charging station can even scroll a message across the front of the display to market or inform the customer. Brilliant networking built in. There's no need to run a data line to each charging station with Coulomb products...they use a cell phone and Zigbee networking in a master/slave configuration. This allows you to install them anywhere there is a Verizon or AT&T cell network. The biggest opportunity I see for the hardware is that it needs a better display so it can tell the user how to operate it. As it is, the Coulomb units don't give a new user clear instructions on how to use it...but once you know, it's simple. charging stations are and keeps track of your usage. 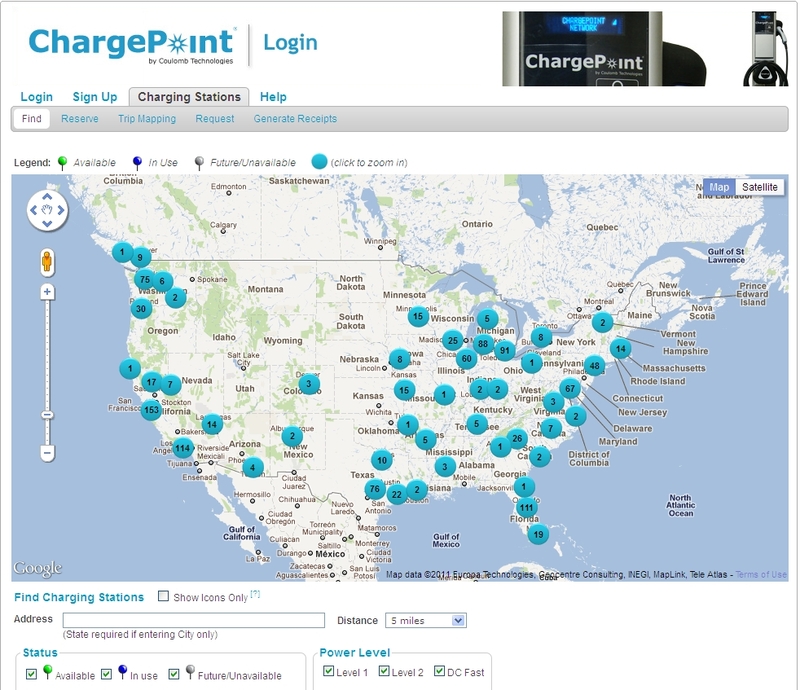 Tell drivers looking for an EV charger where they are located (GPS) and if they are being used at the moment. You can find them via Coulomb's website, Google, Smartphones, and the GPS displays of Electric Vehicles. 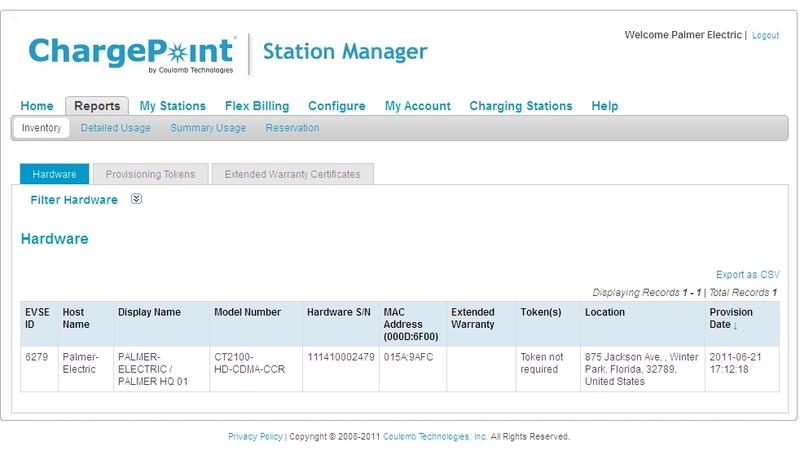 Allow reservation the charging station (new feature). Coulomb units can be reserved so no one else can use it until you arrive. While you won't know if someone parked in the space, you will know that the charger is waiting for you. Taking payment for a charge. Owners of Coulomb units can easily setup pricing models so they can charge for usage (i.e. $2 for an hour weekdays, free on weekends). The drivers can pay via Credit Card, Smartphone App, or Coulomb's ChargePass card (works like a Starbucks card). Coulomb units do not have a magnetic card "swiper"...the card needs to have an RFID chip embedded inside it (i.e., Chase Blink Card or American Express Blue). If you don't have a card with an RFID chip, you can use your SmartPhone or call the 1-800 number on the front of the unit. pricing, access, and marketing messages. Charging Station Control. Each Owner gets access to an Internet Portal (Station Manager) showing all of their EV Chargers. The owner can control the units, get reports on their usage, see how much energy each station has dispensed, plus many other features. Driver Portal. Once you setup an account with Coulomb, you have access to an Internet portal (Driver Portal) which shows you useful information like where the Coulomb chargers are, their availability, your history of usage, and how much energy your vehicle has received. Smartphone application support. Coulomb has nice apps for the iPhone, Android, and Blackberry, which can show you where their chargers are located, guide you to them, and reserve them. 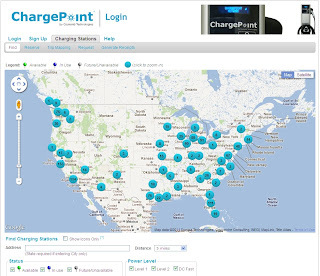 The company has been ramping up efforts to become more of a software company than a hardware company, so that other EVSE hardware vendors will leverage the ChargePoint Network to make their EVSE's "networked" - they call this program Onramp. Pricing is set through Coulomb's distribution channel, but they are competitive with the other networked commercial EVSE's that I know of...even though no other company offers as many features. 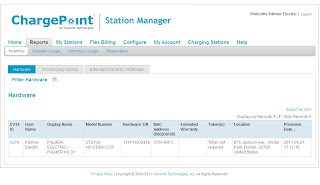 Coulomb charges the station owner an annual fee for these software features and the cellular access to their charging stations. This fee is tiered based on how they will be used and the services that you need (Fleet, Retail, Service Provider, etc.). Overall, I think the Coulomb charging system is like the iPhone: a high quality product packed with features that is simple to use.